MessageExport add-in for Microsoft Outlook lets you save email attributes to the Windows file system when exporting to Outlook .msg email files. Requires Microsoft .Net Framework 4.5, Internet Explorer 8.0 or later. MessageExport is an add-in for Microsoft Outlook 2007/2010/2013 that lets you copy or backup your Outlook email messages to different file formats, including MSG, PDF and MBOX. When exporting emails from Outlook to .msg files, MessageExport includes metadata in the .msg file attributes. This means you can use Windows Explorer to view and sort email files. Are you one of those very organized people who meticulously files every email into its proper folder? 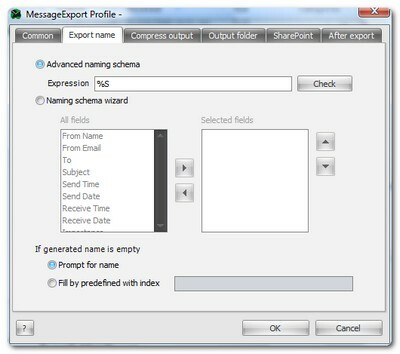 MessageExport lets you preserve the Outlook folder structure while exporting email messages. Assigning a unique file name to exported messages is easy with MessageExport. A Naming Scheme wizard lets you quickly construct a unique file naming using any combination of these fields: To, From, Subject, Send Time, Send Date, Receive Time, Receive Date, Importance, Export Time, Export Date. You can join any of these criteria using "+ _ -". 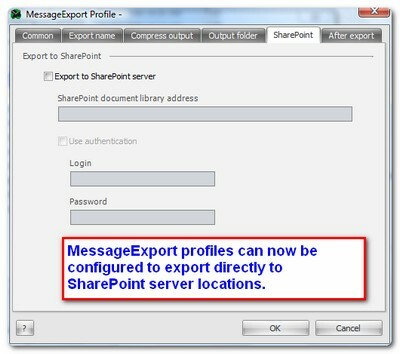 MessageExport is available as an .msi file that can be deployed across your enterprise. *Microsoft and the Office logo are trademarks or registered trademarks of Microsoft Corporation in the United States and/or other countries. 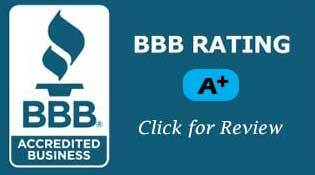 Encryptomatic(R) and MessageExport(TM) are marks of Encryptomatic LLC.